I suppose that it’s some centuries too late to rail about Donizetti’s asinine Tudor operas which pervert history for the sake of improbable, rudimentary if not execrably written dramatic situations. And it’s undeniable that, compared to the Maria Stuarda plot-line compiled for the composer by Bardari, the Cammarano book for Roberto Devereux cannot come as a shock to anyone used to bel canto pot-boiler libretti. But experiencing this conclusion to the Melbourne Opera’s sequence of Donizetti’s Henry VIII/Elizabeth I operas did not make for a particularly happy night in the Athenaeum. Soprano Helena Dix returned to the company to sing the role of Elizabeth and her vocal display was one of the opening night’s highlights from her opening Duchessa . . Alle fervide preci up to the ridiculous self-indulgence of the opera’s finale, Quel sangue versato where the queen’s self-indulgence spills over into bathos. You could relish the precision of Dix’s fioriture alongside the control on display in her ensemble work, all without finding much to fault. But, from the beginning, the characterization of Elizabeth offered little beyond amusement and not-to-be-suppressed memories of Bette Davis in The Private Lives of Elizabeth and Essex. 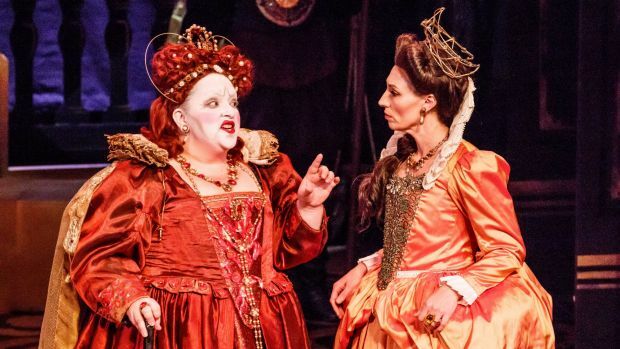 This queen, brought down to the groundlings’ level, is a figure of fun, pettish and slightly ridiculous, certainly the biggest entity on this stage and encased in an unflattering farthingale. The malevolent turn that penetrates her first duet with Devereux, In sembianza di reo, presents as almost childishly spiteful and both Dix and director Suzanne Chaundy seemed unable to give the character a personality with which you might find some sympathy. Matters hardly improve in the queen’s confrontation of Devereux with Sara’s scarf, the proof (somehow) of his infidelity to her. You can see that all the running is left to Elizabeth but her display of the incriminating object is schoolgirl-spiteful at best, as is her intransigence with Nottingham’s requests for mercy. The best recourse here was to ignore the staging and focus on the vocal interplay which, on Dix’s part – once you set aside the overdrawn malice – remained consistently impressive. Henry Choo gave us a well-rounded Devereux, although it was easier to take to the ardour of his Una volta, crudel interchange and consequent duet with Danielle Calder’s Sara than to his initial appearance in front of Elizabeth where the tenor over-stressed the guilty asides both with the Queen and in the pendant scene with Nottingham. Still, Choo made a fine feast of his focal scene Ed ancor, la tremenda porta where Devereux resolves to keep his secrets and endure execution; here was an excellent sample of lyrical and persuasive bel canto, determined and not over-supple but clear-speaking and consistent across its demanding range. Phillip Calcagno, one of the company’s stalwarts, worked hard as Nottingham., the friend turned enemy who serves as the all-too-predictable fulcrum around whom the tragedy turns. His baritone is accurate enough but it lacks pliancy; a single-minded insistence on correct delivery worked in the baritone’s favour during his reassurance of Devereux but proved wearing in his pleadings with Elizabeth, Non venni mai si mesto, probably because of the sharp contrast brought into play with Dix’s fluid phrasing. However, the angrier Nottingham became, the more convincing Calcagno’s efforts. It’s no fault of any singer that he has to indulge in a rapid, hardly credible conversion from dedicated confidante to moustache-twirling vengeful cuckold (or so he believes) in an instant; Cammarano’s dialogue sets up this change and Donizetti was in too much of a hurry for any subtlety. When the penny starts to drop, Calcagno does his best from Orrenda luce balena onward but the transformation is unavoidably melodramatic. The confrontation with his wife that begins Sara, vederlo io voglio gave us the singer’s finest moments where the emotional intensity of this character’s abrupt change in situation almost brought about a commensurate flexibility in Nottingham’s vocal line. Calder’s Sara opened the opera, fittingly enough with a plaint: All’afflitto e dolce il pianto – a marvellous gift from the composer – but the soprano was directed in such a manner that the lines made little impression, coming across as more petulant than tinted with tragedy. Things improved markedly in Calder’s ensemble work, her deliberation a worthy match for Choo in the couple’s renunciation scene and an attention-grabbing counterweight to Calcagno’s vicious recriminations in the husband-and-wife confrontation. Jason Wasley played Lord Cecil without stress, but then there’s not much for the character to do. Eddie Muliaumaseali’i enjoyed the part of Raleigh, who has a scene of conspiracy with Elizabeth, Assente egli era, where he produces the scarf he has found on Devereux. It isn’t much to play with but the bass made each phrase count; his delight in ruining a rival almost made you feel some pleasure in knowing that this knight was to meet his comeuppance under James I some 17 years after the opera’s action. As for the company’s chorus, the general effusions sounded enthusiastic, but the night began in pretty ordinary fashion with the court ladies’ Gemer! Pallor funesto coming across the footlights to scrappy effect. As is customary in these 19th century Italian pre-Verdi works, the male chorus tended to bellow when given the opportunity. Greg Hocking conducted a pit that every so often found it hard to agree on the beat. The overture’s tutti exclamation chords sounded effective but the following reading of God save the king suffered from an uneven woodwind trio where the oboe drowned out the melody-bearing flute. Hocking did little to keep the brass restrained which was a pity as his strings worked hard and efficiently while the horns were not always as reliable. As Hocking knows better than most, the Athenaeum is a small space where the orchestral output sounds acoustically dry with little-to-no resonance. Duets and trios worked effectively in stage-pit combination but the hurly-burly full choruses, enthusiastically essayed, sounded too hefty for the air volume available. In a bid to aid communication, the work was sung in English: a practice that works well when the libretto is worth understanding in detail but not so fortunate on this occasion where the audience found plenty to laugh at in Act 1. This comprehensibility factor favoured recitatives but arias and more complex structures did not always succeed as well as they might have if all singers had been coached in shaping their words. But is there a point in laying bare the bones of this opera? Much of the time, it flies in the face of sense, nowhere more so than in the essential plot element involving a ring that the queen gives to Devereux, to be used by him as a court of last appeal if he gets caught up in trouble. Even at the final curtain, Elizabeth is brandishing this infantile talisman of intrigue, as though the tragedy can be attributed to its misuse, rather than the fact that Devereux was a compleat traitor with a long history, for such a young man, of disobedience and intemperate behaviour. On top of this, Cammarano and Donizetti portray the queen herself as a venal, uncontrolled personage; her last words in the opera are an apparently splenetic act of abdication, although in reality she had another two – almost three – years to live and reign after Devereux’s execution. The legend of the Virgin Queen comes in for a belting as well since her physical infatuation comes pulsing though all too clearly in her musing that begins L’amor suo mi fe’ beata. So, at the night’s end, after the audience’s full expression of pleasure in Dix and Choo’s realizations of difficult roles, the over-riding impression that I took away was one of vulgarity; not just because the creators had played ducks and drakes with the facts but more so that they had demeaned the story, working to an operatic lowest common denominator. I’m one of very few patrons of this mind, for sure, but I’m glad the Donizetti/Tudor experience is over. Here’s hoping the company doesn’t attempt to round out the enterprise with a staging of Il castello di Kenilworth.